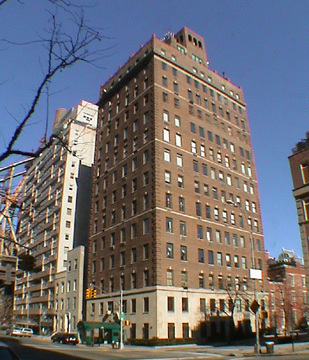 This attractive, 14-story, apartment building was erected in 1928. It is a cooperative and has only 14 units. Overlooking not only the elegant townhouses across 58th Street that share a large communal garden overlooking the East River, but also a row of townhouses tucked behind it on the north side of 58th Street also overlooking the river, this exclusive building has fabulous protected views to the east and south. This building has a doorman, a canopied entrance with sidewalk landscaping and permits protruding air-conditioners. It has a handsome rooftop watertank enclosure, a two-story limestone base with a handsome broken pediment entrance surround, strongly expressed brick quoins, no garage, inconsistent fenestration and no health club. It has three string courses and a cornice one floor beneath its roofline. It is not close to a subway, but there is very good cross-town bus service on 57th Street.